Check out a day of fishing at North Fork Ranch on the South Platte River. T Cross Ranch was recently featured on USA Today Travel Section. This program has been developed by the Dude Ranchers Association to educate DRA member ranch wranglers in Horse Safety and First Aid for the Trail. The program is a reflection of a proactive approach by the DRA to promote responsible and safety conscious horse programs that assist in preparing staff to handle emergencies that may occur on the trail. The purpose of the program is to promote ongoing evaluation of horse safety and risk management practices and skills and to improve the quality of horse programs offered by member ranches. These seminars promote continual evaluation of safety procedures and skills. This program was developed to assist member ranches in their effort to give guest riders an enjoyable experience and in their endeavor to address and monitor horse safety and risk management issues in their ongoing operations. As an instructor of this program Ted Harvey will be conducting the Horse Saftey class on the following dates and locations. to begin our Colorado vacation. Article by Ted Harvey. The guest ranching industry began in the late 19th century with cattle ranches that were used to accommodate guests as a revenue source. With scenery of unsurpassed beauty, abundant wildlife and genuine western hospitality, word quickly spread about the recreational opportunities of a real western ranch. The “Dude Ranch Experience” became so popular that by the early 1920s guest ranches were estimated to be more than 1,000 operations in Wyoming, Montana and Colorado. Today, many guest ranches are still operating throughout the Rocky Mountain West, offering once-in-a-lifetime opportunities in spectacular settings. Most of these ranches border national forest lands providing unlimited areas for horseback riding, hiking, wildlife and access to exceptional fishing and hunting. Another method that presents an inexpensive means for entrepreneurs to acquire a business is a U.S. Forest Service Lease. This type of ranch operation was formed in the early 20th century and established not as deeded acreage, yet as a parcel of forest service land designated for use as a guest ranch. The rancher purchases the right to operate the ranch and pays a minimal annual fee to the forest service. Many dude ranchers’ would not consider another way of life than owning a guest ranch. It can be profoundly rewarding and provide a profitable income. In addition, there are potential tax benefits both as an agricultural operation and as a business. Due to prime location and historical significance, many guest ranches on the market today are among the most sought-after private ranches in America. With the national economy on the rebound the guest ranching industry remains strong. The National Dude Ranchers Association currently has over 100 member ranches and there are over 300 quality guest ranch operations throughout the western states. Although real estate prices are beginning to rise there are still excellent guest ranch opportunities available today. Working and managing guest ranches in Colorado, Wyoming and Montana, Ted Harvey has a unique understanding of these operations. Ted has the knowledge and network to assist investors and ranch owners in the sale and acquisition of a guest ranch. For more information on guest ranching, contact Ted Harvey at 866.734.6100 or visit our website at www.livewaterproperties.com. Seasons Greetings from Cody, Wyoming. 2012 has flown by with my Dude Ranch Consulting business developing and growing through out the year. I have had numerous dude ranch consulting projects including management of Turpin Meadow Ranch in Jackson, Wyoming and financial projections and business plans for several ranch operations. 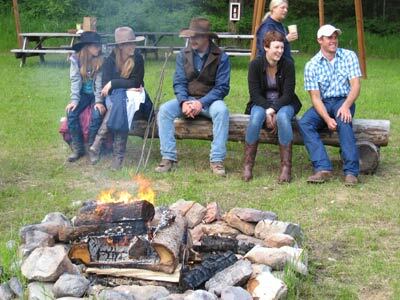 My Dude Ranch Vacations has a brand new website with 20 featured ranches all over the West. www.duderanchvacation.co I have been fortunate to visit many of these ranches and have been horseback riding in some fantastic scenery on great horses.In addition to my consulting services I have obtained my real estate license this year and am working with Live Water Properties specializing in distinctive ranch properties. This year’s success would not have been possible without the help and support of all my friends and business connections. I wish everyone a happy and prosperous year.